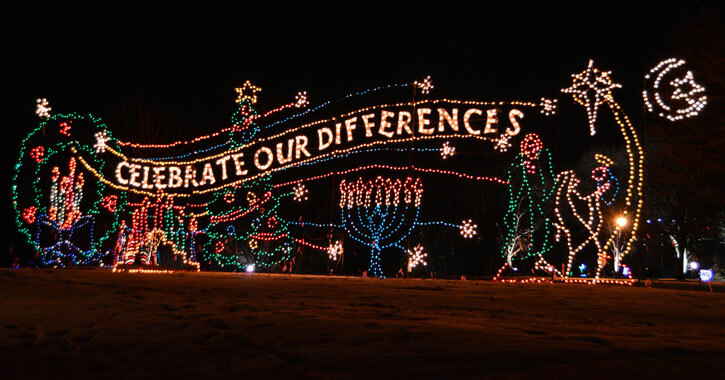 Each year Price Chopper/Market 32 puts on an amazing display of holiday lights in Washington Park that you can drive through to enjoy, with proceeds going to a local charity. Visit the Price Chopper/Market 32 Capital Holiday Lights in the Park this season for a spectacular, awe-inspiring show with over 125 light displays and scenes in Albany. After you drive through this amazing display, enjoy all sorts of crafts, costumed characters, refreshments, and even Santa himself at the Lakehouse through December 23rd. Little ones will be able to whisper their Christmas wishes in Santa's ear while enjoying all sorts of fun and activities. All vehicles enter the display at the Madison and New Scotland Avenue entrance to Washington Park. Call the Albany Police Athletic League (PAL) at 518.435.0392 if you have questions about other vehicles not listed above. Price Chopper/Market 32 Capital Holiday Lights display runs Sundays through Thursdays from 6pm to 9pm, and Fridays and Saturdays from 6pm to 10pm from November 23rd through January 2nd; The Lakehouse is open for activities during the same hours. Santa will be at The Lakehouse through December 23rd. The Lakehouse is closed December 24th, 25th, 31st, and January 1st -3rd , but the drive through-show will run at its normally scheduled time. *Note: These special events are the only time you are permitted to walk through Washington Park. Albany PAL is presenting its annual Craft Beer, Wine & Spirits Fest at the Lights. Stroll around the lake and enjoy music and the lights with your family and friends as you savor the "Taste of the Holidays!" Tickets are $25 in advance at AlbanyPAL.org or $45 at the door. This event features soup samplings from many area restaurants, taverns, delis. Enjoy live music, crafters, visits with Santa, and a leisurely stroll around the Price Chopper/Market 32 Capital Holiday Lights. Tickets are $7 for adults and $3 for kids 10 and under in advance at AlbanyPAL.org or $12 for adults and $5 for kids 10 and under at the door. Take your pet for a walk around the lake as part of a walk-only Charity Walk Night to benefit the local Charities of Choice for 2018. Suggested donations are $5 per person or $10 per family. Ride your bicycle through the lights for a donation of $5 per person or $10 per family. Proceeds from this night help Albany PAL provide free bike helmets to area kids! The lights are on and you are welcome to the 22nd annual Price Chopper/Market 32 Capital Holiday Lights in the Park! On Sundays in December, the first 125 children receive a special gift, courtesy of Albany PAL, the Albany Patroons, and CDTA. Your favorite Albany Broadcasting stations will be taking turns keeping Santa company - stop by and see them for prizes and giveaways. Participating stations are B95.5, JAMZ 96.3, FLY 92.3, 100.9 The Cat, and Magic 590 AM. Trolley rides are available most nights through Advantage Transportation. For more information or reservations, contact 518.433.0100. 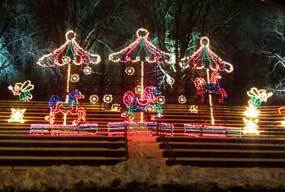 Camp Pinnacle will provide horse drawn carriage rides through the Lights! Call Kayla or Bill today at 518.872.9100 (Monday through Friday, 9:00am-3:00pm), or 518.894.1598 to make your reservation. All proceeds from the 22nd Annual Price Chopper/Market 32 Capital Holiday Lights in the Park benefit the youth programs of the Albany Police Athletic League (PAL). PAL provides our youth with numerous programs, including but not limited to: community service projects, youth mentoring program, computer clubs, summer day camps, summer track camp, movie with a PAL, karate and martial arts clubs, show stoppers stem teams, after school homework club, lacrosse, cooking with a PAL, science on patrol, basketball, baseball, bowling, volleyball, mindplay competitions, chess, golf, publishing club, double dutch, cartooning and drawing, PAL marching band, police explorers, youth leadership council, PAL/art Mitchell College scholarships, educational field trips, PAL/Pioneer Toy Program (distributes more than 4,000 free toys annually to needy children), and many more. Go East on Route 20 into Albany. Bear right at fork in the road (intersection of Allen Street). Continue East on Madison Avenue to New Scotland Avenue entrance. Turn left into Washington Park. Go West on I-90 to I-787 South. Continue South on I-787 to Madison Avenue exit. Proceed West on Madison Avenue to New Scotland Avenue. Entrance to Washington Park is on the right. Take I-87 South to I-90 East. Take Exit 6 towards Arbor Hill. Continue straight on Henry Johnson Boulevard, following it to New Scotland Avenue entrance. Take I-787 North to Exit 23 or (North to Southern Boulevard.). Take Southern Boulevard to Delaware Avenue. Take a right on Delaware Avenue and proceed to Madison Avenue. Take a left on Madison Avenue to the New Scotland Avenue entrance. Volunteers are needed nightly! In addition to the lights, volunteers also work inside the Lakehouse to transform it into Santa’s Workshop with Santa, crafters, and more. If you're interested in volunteering please contact Sherry at PAL at 518.435.0392. 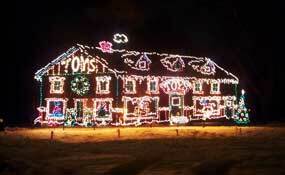 For more information about Price Chopper/Market 32 Capital Holiday Lights in the Park, call Albany PAL at 518.435.0392.